Northern Symphony Festival – The UK’s first ever symphonic metal festival – has announced the first two bands to be added to the bill. The festival is set to take place on Saturday 4th April 2015 at The Venue in Selby, North Yorkshire. Quietus’ debut release is available for free download through their bandcamp page. 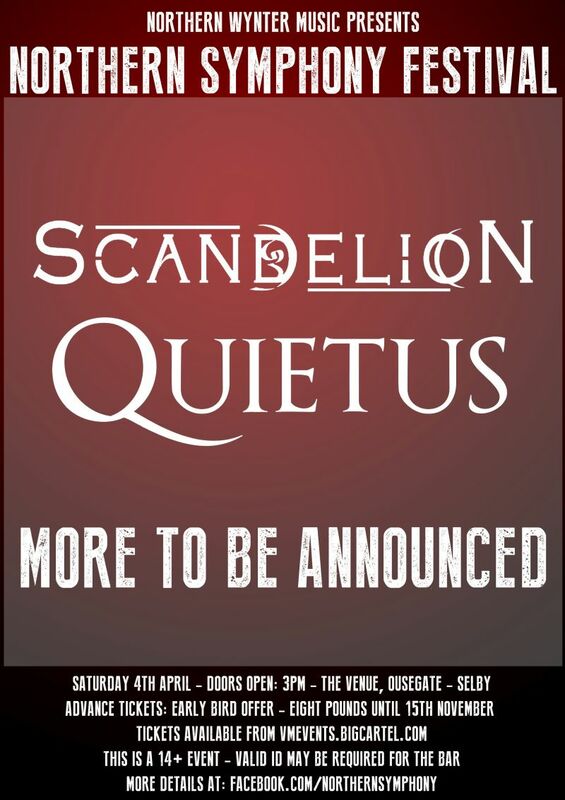 The second of the first two bands to be announced are gothic doom metallers Scandelion. With four releases under their belt, the band made a name for themselves in their native homeland of the Canary Islands before relocating to the UK. Northern Symphony Festival will be one of the band’s first UK shows as well as their first UK festival appearance. Tickets for the event are available from this location. They are set at the early bird price of only £8 until November 15th. Due to venue regulations, it is a 14+ event and you may need ID at the bar! Further details about the festival can be found on it’s facebook page.